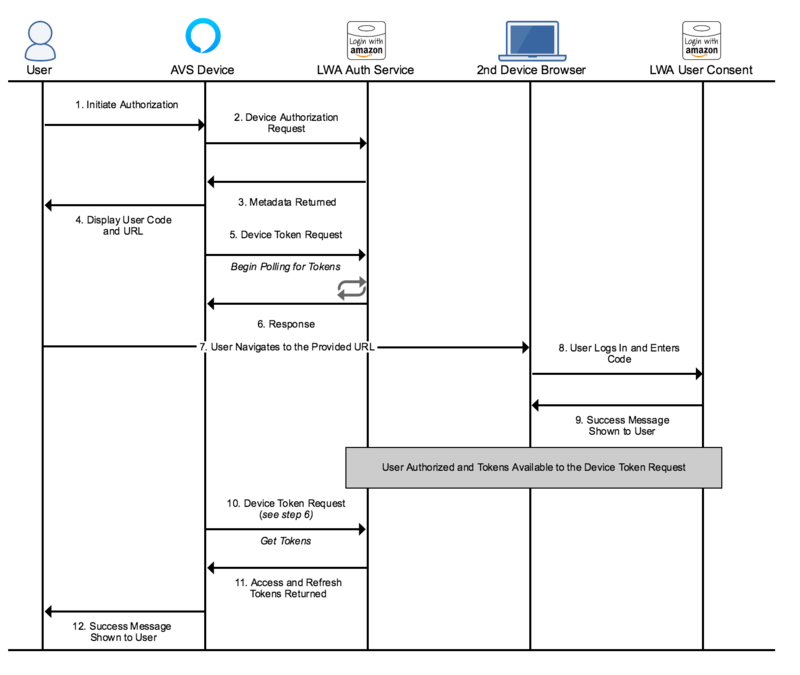 To access the Alexa Voice Service (AVS), your Alexa-enabled product needs to obtain a Login with Amazon (LWA) access token that is sent with each request to AVS. This document describes code-based linking (CBL), an authorization method optimal for products with limited or no access to character input, such as a television or smart watch. During product registration, the user is provided with a short alphanumeric code, and a URL. 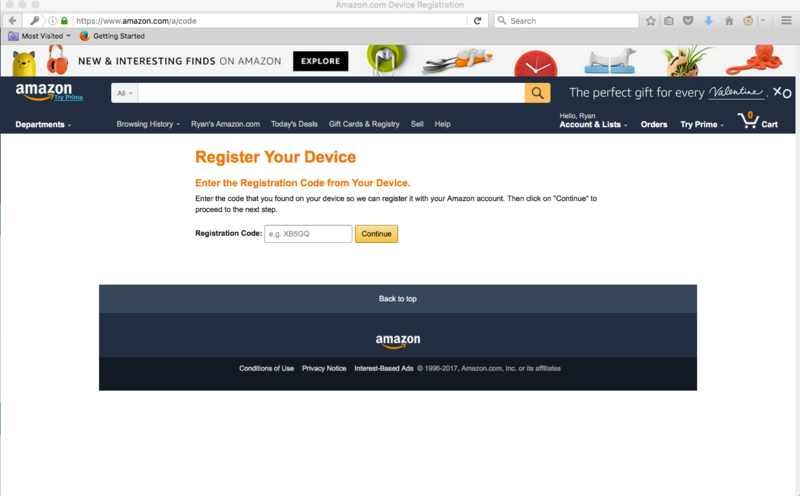 On a separate device with access to a browser, the user visits the URL, logs in with their Amazon credentials, and enters the short code to link the product with their Amazon account. Once linked, the product notifies the user with a splash screen and provides access to AVS. Locate and click on the Security Profiles tab, then select Other devices and platforms. Enter a Client ID name, then click Generate ID. Save the Client ID, you'll need this later. First, your Alexa-enabled product must make a POST request to obtain the user code and URL from LWA. If a valid response is returned, it must display the user_code and verification_uri to the customer. Note: This API implements the Device Authorization Request component of the OAuth code-based linking specification. response_type: The expected value is device_code. This informs the service that this is a CBL request. client_id: The Client ID you created in step 1.
scope: The expected value is alexa:all. This specifies permissions for your product. scope_data: Additional JSON that includes product-specific information, such as productID and deviceSerialNumber. Sample JSON is provided below. productID: The Device Type ID for your product. To access this information, navigate to Amazon's Developer Console. After you've logged in, click Alexa, then Get Started > under Alexa Voice Service. Click Edit next to a registered product (or create a new one). This page contains both Client ID and Client Secret for your product. productInstanceAttributes: an object containing the deviceSerialNumber. deviceSerialNumber: A key that uniquely identifies this instance of your product. For example, this could be a serial number or MAC address. Note: This is a sample scope object before it is URL-encoded. Optional: Include the Accept-Language header in your request to select the language the login and registration language for your user. Accepted values: en-US, de-DE, es-ES, en-GB, fr-FR, it-IT, pt-BR, ja-JP, zh-CN. When your product receives a response to the Device Authorization Request, it must display the user_code and verification_uri to the user. Use the design guidance and example screens provided in Setup and Authentication. When the user navigates to the verification_uri, they are instructed to login with their Amazon developer credentials and enter the provided user_code. The Code Registration Page implements the User Instruction component of the OAuth specification. After entering the user_code the user is directed to a page indicating a successful or failed authentication. If authentication fails, the page will provide the reason for failure (code already authorized, unrecognized, code, etc.). After you've instructed the user to log in, your product begins polling for an access_token and refresh_token. grant_type: The expected value is device_code. This informs the service of the grant type. device_code: The code returned in Device Authorization Request. user_code: The code displayed to the user. This code is entered by the user during registration. expires_in: The number of seconds the access token is valid. Note: It may take the user some time to complete registration (or registration may be abandoned), during polling the following responses may be delivered: authorization_pending, slow_down, invalid_code_pair, invalid_client, unauthorized_client. On invalid_code_pair, restart the registration flow.